To mark the publication of Shakin’ All Over: Popular Music & Disability, I present in countdown form my (current) Top Ten songs of disability. I’ll post a short piece of writing about each one, drawing from or developing what I’ve written about it in the book, and illustrate with a link to a video or image of the artist(s) performing. From 10 to no. 1, top of the charts, that’s the business after all. I’ve already worked out what they are, and frankly there are about 30 or more of them, so I have some work to do to get it down to ten. And no, they are not all positive, or overcoming, or unproblematic, though some may be. I really look forward to your comments and nominations too. 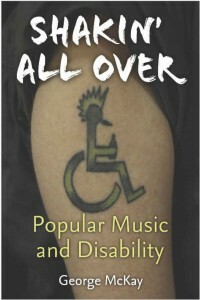 BTW here is a terrific blog with two sets of disability songs, lists made by Anthony Tusler for the Society of Disability Studies annual dance: ‘Don’t forget who’s taking you home’. And here is a regularly updated database entitled Musical Representations of Disability (currently it has around 250 entries, including some from popular music). It’s maintained by the Music and Disability at the AMS and SMT blog, and relies on us to add entries. And below are some of your other suggestions and comments, that have come in from other routes (via email, facebook). Vic Chesnutt’s ‘Debriefing’ from his brilliant album North Star Deserter deserves a place on any list of songs by disabled musicians. when i deplete the funds / and they’re forced to pull the plug / chisel on my tombstone / debriefing, debriefing, debriefing, debriefing. is ‘Epilepsy is dancing’ by Antony and the Johnsons on your list yet? I’m sure most people on the list are familiar with this already, but just in case you’re not … anyone looking for lists of themed songs about pretty much anything could do a lot worse than consult The Guardian’s ‘Readers Recommend’ column. This has quietly turned into a genuinely impressive resource over the years and now boasts around 360 themed entries, from the obvious (colour, food, countries) to the unexpected (songs without a chorus, songs with less than ten words, B-sides). It offers an excellent “instant lesson plan” formula for undergraduate level teaching (particularly on songwriting modules) or quizzes, and might also be described as a good way to while away a rainy afternoon. Take the spokes from your wheelchair / And a magpie’s wings / And tie ’em to your shoulders and your feet! / I’ll steal a hacksaw from my dad / And cut the braces off your legs / And we’ll bury them tonight in the cornfield. let me just check if this listing, or the call in the first place, has been delivered for consultation of the people it might refer to. as a father of a disabled person i’m a bit concerned of the light-heartedness of this discussion. one of the most renown punk bands in Finland at the moment (or at least a year ago) was a group “Pentti Kurikan nimipäivät” (PK’s name day), comprised of four men with various diagnoses, ranging from autism to down syndrome. there’s actually a feature documentary film of them, you might find it on U-tube. i do think the topic is more important than we care to admit, for a reason or another. apologies for the bluntness. The documentary *** mentioned [above] is called The Punk Syndrome in English, highly recommended! “Save the Last Dance for Me,” by the Drifters. Doesn’t seem like a disability song perhaps, until one considers that it’s by Doc Pomus (and Mort Schuman), at which point it becomes one of the greatest disability pop songs (in English) of all time. Thank you Jon. Am not sure about First World War songs of disability–suggestions, anyone?–but I often think about Wilfred Owen’s powerful poems of that war and disability like ‘Mental cases’ and especially ‘Disabled’: ‘He sat in a wheeled chair, waiting for dark, / And shivered in his ghastly suit of grey, / Legless, sewn short at elbow’, who only joined up because ‘Someone had said he’d look a god in kilts’. Hi George. Great thread. Very interesting. However I also have a question for you, or any readers. I’m currently doing a lot of reading on The Great War (1914-1918) in anticipation of next year’s centenary. This was a period when the massive amount of injuries and amputations led to generalised fear of disability among the troops, a common anxiety expressed in their diaries and letters home. So I’m beginning to wonder if this was reflected in any songs from the period? Have any war time trench songs or popular compositions surfaced? Might this have been considered unpatriotic defeatism? Are there any songs about wounded veterans that later found their way into 1920s music halls? I don’t know that one, v interesting, thanks Amy. I’ll look it up and have a listen. Anastacia’s “Left Outside Alone” might be an option; it seems to detail the plight of an autistic man (her brother is autistic and, although she might not realise it, she has traits herself). Not sure if you know the track but that is my suggestion at least! I’m sure I can come up with more.